Buy works – Ponomaryov Nickolay Afanasyevich | (1918, Aleksandr-Grushevskiy – 1997, Moscow). 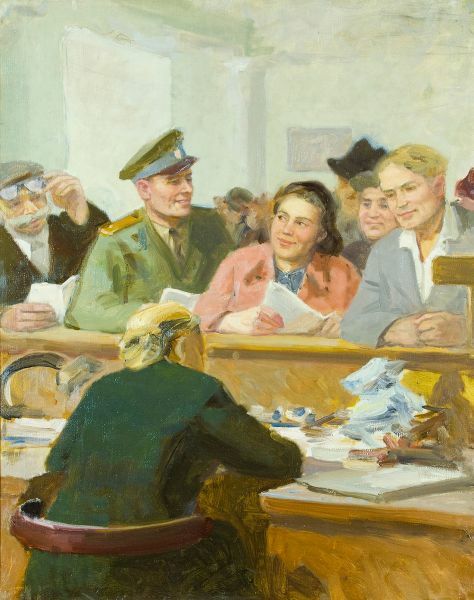 Ponomaryov Nickolay Afanasyevich (1918, Aleksandr-Grushevskiy – 1997, Moscow). Active Member of the USSR Academy of Arts, the USSR People’s Artist, the USSR State Prize Laureate (1951). Honorable Member of the Union of Artist of the German Democratic Republic. Graduated from Moscow State Arts Institute in 1946 and completed the post-graduated courses therein in 1950. Studied under M.S. Rodionov, K.N. Istomin, G.T. Goroshchensko. In 1957 was awarded the gold medal of the USSR Ministry of Culture and the World Exhibition bronze medal in Brussels (1958). Since 1949 gave lessons at Surickov Moscow State Arts Institute. Since 1973 – Chairman of the Board of the USSR Union of Artists. Created many easel paintings devoted to Soviet miners, workers of Vietnam, India, Egypt. The artist’s works are exposed in the Tretyakov State Gallery. 95000 - 150000 rub. 95000 - 150000 rub.